Using KSQL, the SQL streaming engine for Apache Kafka®, it’s straightforward to build streaming data pipelines that filter, aggregate, and enrich inbound data. The data could be from numerous sources, including applications, log files, databases, and IoT and network devices. In the two previous articles (1 | 2) in this series I’ve shown how to use Apache Kafka and its Connect API to ingest syslog data from multiple sources. Using KSQL, it’s easy to filter it as well as use aggregations to drive simple anomaly detection. The output from KSQL stream processing is a Kafka topic, which can you stream with Kafka Connect to a data store such as S3, or use to drive applications directly such as push-notification alerting. In this article we’re going to conclude our fun with syslog data by looking at how we can enrich inbound streams of syslog data with reference information from elsewhere to produce a real-time enriched data stream. The syslog data in this example comes from various servers and network devices, and the additional information with which we’re going to enrich it is from MongoDB, which happens to be the datastore used by Ubiquiti network devices. 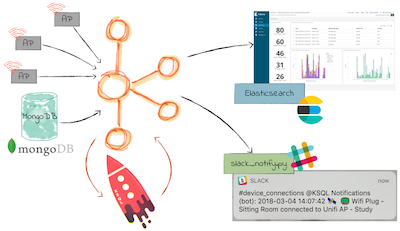 With the enriched data we’re going to drive some real-time analytics through Elasticsearch and Kibana, as well as trigger push notifications based on activity of certain devices on the network. I’m a big fan of Ubiquiti’s network devices, including their Unifi access points. I could wax lyrical here as to why, but I will instead refer you to Troy Hunt’s thorough write-up of Ubiquiti. One of the nice characteristics of them is that there is a ton of configuration that you can do to do them, of the sort that typical consumer-grade networking equipment just doesn’t support. So this in itself it pretty neat, as we can filter in realtime the syslog data that’s coming in. But…how about being able to identify the access point and user device names? At the moment we can only see their MAC addresses. Read on to see how! To get additional metadata from our network devices, including things like the access point and user device names, we’re going to stream this data from its source into Kafka. Ubiquiti uses MongoDB to hold this data, and there’s a great change-data-capture (CDC) tool built on Kafka Connect called Debezium that supports several source databases—including MongoDB! We can use this to stream the current contents of the database into a Kafka topic, as well as all and every subsequent changes to that data. This means that in effect we maintain a live mirror of our MongoDB database in Kafka itself. We don’t need to do some kind of convoluted lookups from Kafka out to a database each time we want to look up some reference data, since we have now that reference data within Kafka itself. For the purposes of this blog, I cloned my MongoDB instance from the Ubiquiti controller onto a separate server. For a real-life example then we’d use the live controller itself – since working against a clone means that any new changes to the data (such as new access points being created) won’t be available to us. Now let’s declare all the columns of interest in our schema, and using CREATE STREAM AS SELECT (“CSAS”) generate an Avro topic based on the source stream. This resulting topic will hold not only the transformed data that’s currently on the source topic from MongoDB, but also any subsequent changes to that data. Because we want to join this data (which is, in effect, reference data) we need to ensure that the topic’s messages are keyed on the column on which we want to join, which is the IP address. Perfect! The final part of this is to take the resulting Kafka topic from this KSQL streaming transformation and use it as the basis for our KSQL table which will be joined to the syslog data. Q: Why did we create a STREAM of device data, and then a TABLE? When should we use STREAM and when should we use TABLE? A: Great question! Logically, we are using the device data as a TABLE. That is, we want to join an inbound stream of events to our device data in order to enrich it. We want to know for a given key, what the corresponding values are. For a given device row, what’s its name, it’s model, it’s version etc. So it is most definitely a TABLE. But, in order to join to a TABLE, that TABLE must be keyed on the join column. And as we saw from inspecting ROWKEY above, this was not the case. So we utilised KSQL’s powerful re-keying functionality to rekey the topic automagically. And to do that, we treat the inbound data as a STREAM. Why? Because it’s simply an inbound Kafka topic of events, partitioned on one column and on which we want to partition another. Each event (in this context, a change to the source devicedata on MongoDB) simply needs re-routing to the output topic with the new partitioning key. But what about the user device—the third column in the above output? All we have is a MAC address (obfuscated in the examples above). Wouldn’t it be nice to see the name of the device as well as the access point? Well, you know what’s coming now! So every time a user’s device connects to an access point, we get to see the name of the access point, the name of the user device, and the type of the device. We’ll persist this as a stream, because we’ve not quite finished this exploration yet! Streaming the Kafka topic to Elasticsearch is easy using the Kafka Connect Elasticsearch plugin. Take a look at the Elasticsearch mapping template and Kafka Connect configuration I am using. 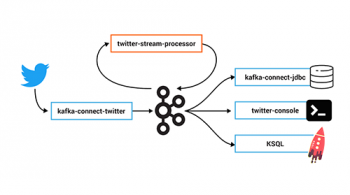 In this mini-series of blog articles we’ve seen the power of Apache Kafka—including Kafka Connect—and KSQL to build applications and analytics on Apache Kafka as an event streaming platform. Using KSQL, it’s simple to create scalable real-time stream processing applications, using just SQL—no other coding required! Kafka Connect provides a configuration-file based method for powerful streaming integration between sources of data into Kafka, and from Kafka out to targets such as Elasticsearch. I have scenario and I would like to ask you if it could be implement with KSQL or not. if I have a messages come from external source to Kafka topics, these messages has a type. 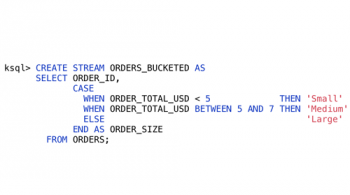 Could I by KSQL specifying every message type with specific KSQL query ? as example; message type X when it enter in topic, KSQL X will run to do job X.
I hope my question clear. It’s not entirely clear what you’re asking, sorry. Perhaps head over to the #ksql channel on http://cnfl.io/slack and discuss there? thanks!